This album is relentless, skilfully made, and guaranteed to fill up the mosh pit. 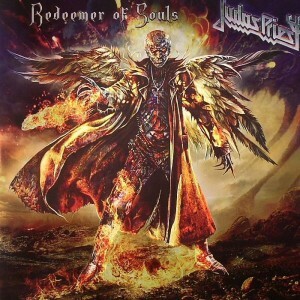 At times it would be nice if Judas Priest changed it up more, as there are one or two songs that are simply predictable. Redeemer of Souls, the 17th album from celebrated metal legends Judas Priest, was hotly anticipated for some time before finally being released. They haven’t released anything since 2008, and since then guitarist K. K. Dowling has left, with Richie Faulkner taking his place. “Dragonaut” explodes in a mess of thunderclaps and electrifying guitar, settling to a punishing blend of heavy drums and exquisite riffs. Title track “Redeemer of Souls” continues the relentless onslaught of classic Judas Priest style, as it brings in driving bass and more epic, myth-inspired lyrics. “Halls of Valhalla” makes it clear that Faulkner has found his place in the band: his chiming, epic guitar and meaty riffs dominate the track. “Sword of Damocles” brings things back to heavier, more intense metal, with even more focus on punishingly hard bass and drums alongside dramatic lyrics. “March of the Damned” continues the darker theme, bringing in some dark bass and drums that sound like the feet of the damned hitting the ground; it’s a powerful effect. “Down in Flames” returns to noodling, with ever-building backup guitars that create a powerful rhythm alongside some excellent harmonies. This track calls mainstream 1980s metal to mind, but that is in no way a bad thing. “Hell & Back” is a more mournful number, a tale of the difficulty of redemption with a slightly slower tempo and some powerful bass underlining ambitious riffs. “Cold Blooded” is a slow burner that keeps your attention with stunning vocals and a relatively moderate pace for a while before bursting into exuberant drums and yet more noodling. The electricity continues with “Metalizer”, which seems designed to send people flooding to the mosh pit. This song never lets up, and Rob Halford’s lead vocals alternately croon at and command fans to listen. “Crossfire” is an abrupt shift to a bluesy guitar sound and entrenched, meaty bass, with very little lost in the way of momentum. The chorus is also addictively catchy in its own way, so you will find yourself singing it later. “Secrets of the Dead” brings in the morbid sound of chiming church bells and swirling wind before launching into yet more epic riffs. At this point that kind of shift can be easily predicted though, and the song doesn’t offer anything surprising at this stage of the album. “Battle Cry” evokes the sound of stadium rock classics at the beginning, allowing some luscious guitar work to build intensely before dropping back into relentless rhythm again. The album’s final track, “Beginning of the End”, is a surprising change of pace to a sadder, more melodic and thoughtful sound. If you invested in the Deluxe edition of Redeemer of Souls, there are five more tracks. “Snakebite” is an enjoyable slice of old fashioned rock and roll. “Tears of Blood” is really more of what you will come to expect on this album, but it’s not unpleasant. “Creatures” is richly textured, with pounding percussion beneath unrelentingly heavy guitar; it builds to a classic Priest chorus that will compel you to shout along. “Bring It On” is more of the same, and while it’s a good track, it doesn’t add a tremendous amount to the album beyond more of that classic rock and roll vibe. Finally, “Never Forget” finishes things up with a dreamlike, and surprisingly touching, power ballad in tribute to the enduring power of friendship, fans, and music. Overall, this album has far more high points than low points, and Judas Priest fans will not be disappointed. It is filled with everything that we love about Judas Priest, and only a few tracks that should have been left on the cutting room floor. Find the most competitive price for ‘Redeemer of Souls’ in the table below. If viewing from a mobile device please click on + to get more information.